The woman singing on the left is most likely Frances as she appears in many of the photos in the scrapbook. Frances “Fanny” Passmore Lowe, a member of the class of 1908, documented her life shortly before, during, and after Bryn Mawr through scrapbooking. Frances traveled from Minneapolis, Minnesota to attend Bryn Mawr College where she studied History, Economics and Politics. She made a couple of clever submissions to her yearbook and was described as “undauntable” in the presence of M. Carey Thomas, the second President of the College, by a fellow classmate. She spent her summers in Pasadena, California with her sister and was one of the notable guests at her first college reunion on May 16, 1909. By November 1919, Frances worked a “low brow but enjoyable profession” as a buyer for a Minneapolis company that often required her to travel to New York. 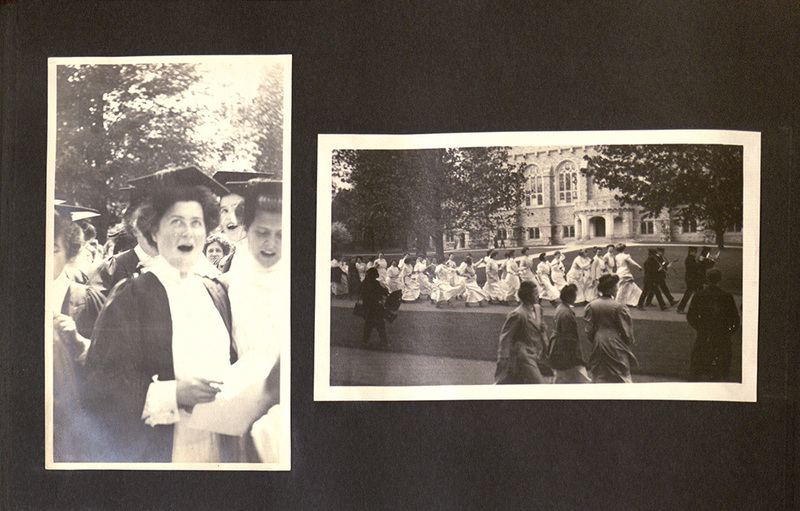 After the 1919 mention in the College's Alumnae Bulletin, it is hard to locate her in subsequent College publications. This project was created by Elizabeth Reilly, Bryn Mawr College Class of 2014, as a way of exploring both the habit of women's scrapbooking in the early twentieth century and its digital legacy in the twenty first. Frances Passmore provided no captions for any of her pictures nor are they necessarily organized chronologically; the exhibit raises just as many questions as it provides other answers.